Hello friends. It’s the first cool day of late summer here in Sydney today. It’s kind of nice, even for a heat-loving old girl like me. So I’m thinking about changeable weather and new seasons. Old faithful followers of this blog will know it has been a long while since the old days of regular posts here. I’ve felt bad about my disconnection from this blog over the past – well, the past year, really. I have toyed with the idea of shutting up shop, quite often, but something has stopped me each time. I can’t quite account for my absence here, really. I still cook all the time, but I’ve somehow lost the impetus to write about it so much. Maybe it’s a simple as the momentum finally running out after four or so years – I started the blog way back in 2009. So, with sincere apologies to new followers and subscribers who signed up to a cookery blog, I’ve had an idea. I’m going to branch out from writing strictly about cooking, and just write about whatever takes my fancy. What do you think? The thing I really loved about blogging when I first began was the luxurious freedom and looseness of it, and somehow over the years I think I lost sight of that, and began to feel a sort of professional obligation to this space – when the whole point of starting it was to write stuff that was not related to my usual writing life at all. That it could be a place to write in a much more relaxed, dreamy way. I still love that idea. I feel that my days are very full with lots to think and talk about. I spend huge amounts of time reading and writing all kinds of stuff – I’m trying to complete a PhD this year which involves finishing my new novel and producing a thesis about psychology and creativity – and I’ve been doing some work I absolutely love with a new colleague and old friend. I’m lately involved with the beautiful Camdenville Paddock Community Garden, where I somehow got myself elected secretary (yikes), and I still do lots and lots of cooking. I often feel the urge to share some bit of interesting reading I’ve found online (like this great article a mate James sent me today, about procrastination, or this profile of Baz Lurhmann my friend V sent me last week), or information about something that makes a huge difference to my life, like my new swishy standupanddowny desk which still retains my battered and beloved old teak desktop but means my back and neck pain is much reduced, or how interesting I find the writers I talk to for my digital magazine. As I’m doing a lot of private and some public talking about writing, and writing processes, probably lots of my posts will be about that. But they might also be about how I just grew my first capsicum. Or about what I’ve been reading and loving lately. Or what it’s like to get out of the city and get immersed in my own weird new book for a week (next week). 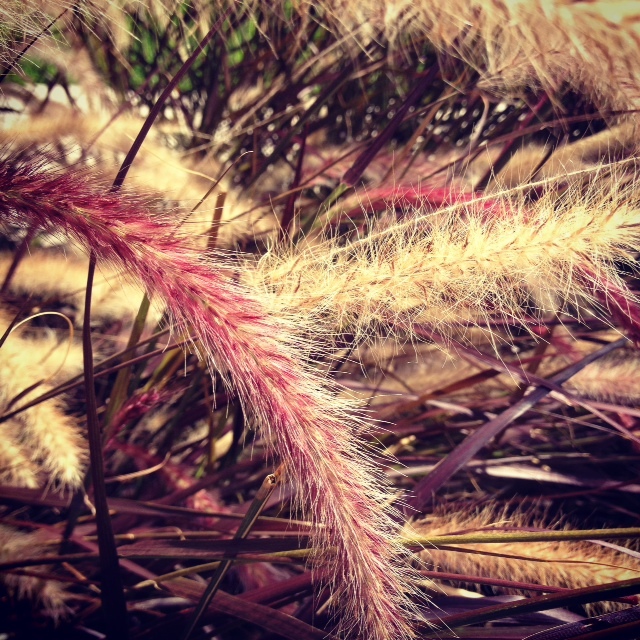 Maybe it will sometimes just be a photo, like this one, of the rather beautiful grasses I saw at uni last week. Anyhow, we’ll see. I’d love you to stay and hang out here with me, but won’t be remotely offended if you unsubscribe and go find a proper cooking blog that actually is what you were looking for in the first place. And if you stay tuned, we’ll talk soon.